Muggles Take Notice: 'Pottermore' Is Coming : The Two-Way Author J.K. Rowling says the website will be a "safe, unique online reading experience" built around her Harry Potter books. And that she'll be sharing "additional information I've been hoarding for years" about the wizard and his world. There's great excitement today among Harry Potter fans. 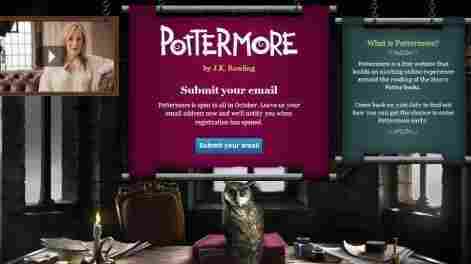 Author J.K. Rowling has gone on the Web to say that in October a website called Pottermore.com is launching — and that it will be a "safe, unique online reading experience built around the Potter books." It will be the place to buy, for the first time, e-book versions of the Potter series. Also — and Muggles will be pleased to hear this — she promises she'll be on the site to share "additional information I've been hoarding for years about the world of Harry Potter."